Game Day is upon us once more here at spalanz.com, and today I’m taking a brief look at the Star Wars role playing game system from Fantasy Flight Games, which is kinda involved, so this blog may get a little sprawling! 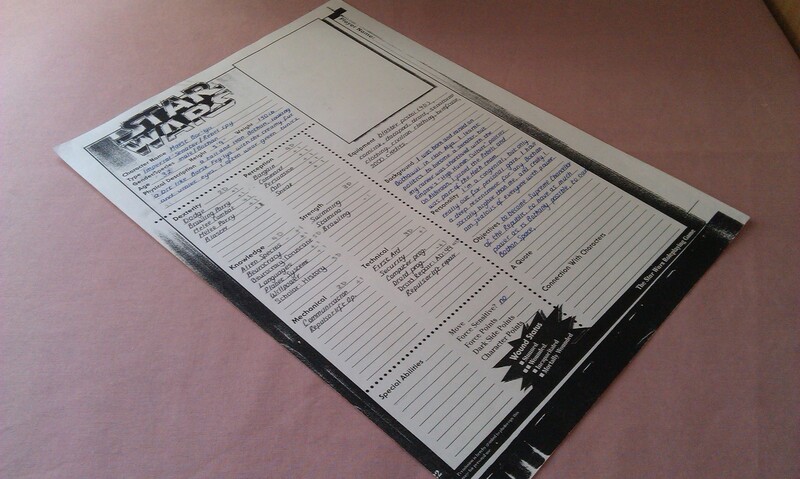 I’ve previously looked at Star Wars RPG systems from West End Games (here!) and Wizards of the Coast (here! ), so this is just the latest in the illustrious line of such products! Let’s get to it! The Star Wars license has been held by FFG since 2011, though they had a few problems with both their card game and the X-Wing miniatures game, so they didn’t actually publish any games for roughly a year after procuring the license. At GenCon 2012, they unveiled the RPG system as a tri-part thing, three distinct books that would focus on three distinct aspects of the galaxy far, far away, but all of which would be compatible with each other. The first of these to come out was Edge of the Empire in 2013, which dealt with the galactic fringe. It was followed by Age of Rebellion in 2014, which dealt with the military of the rebellion, and finally Force and Destiny in 2015, dealing with Force users and the Jedi remnant. Each of these core rulebooks also came with a Beginner Game, which featured maps and tokens, as well as a slim beginner adventure that teaches you the game as you play, and of course the dice you need. The Star Wars RPG was designed by Jay Little, who had previously been behind the Warhammer Fantasy Roleplaying series, and is a huge lover of custom dice. But before we get into that, let’s take a look at the character stuff! When you play the RPG system from Fantasy Flight, you create your character as is standard for such things, picking a species and career, the latter giving you a choice of three specializations. 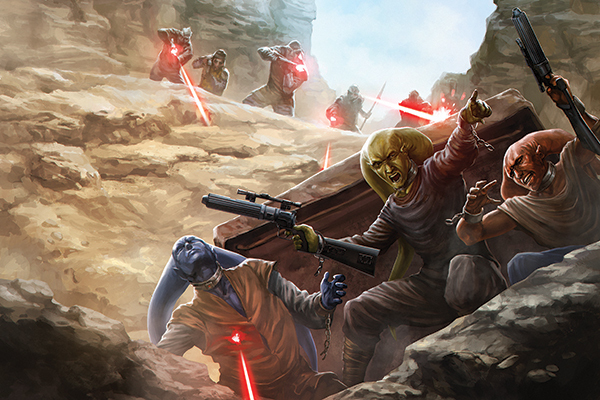 For example, using the Edge of the Empire book, you might choose to be a Twi’lek Explorer, which will give you a choice of following the Fringer, Scout or Trader specializations. Each of these three has a unique talent tree in the book that describes the arc your character can expect to follow. The way that character creation works in this system is quite closely driven by story, and the book constantly asks you to think about this when you go through to make your character. In addition to this, there is a further level added to the creation of your character that is somewhat unique to each strand of the RPG. For Edge of the Empire, that level is called Obligation, and represents “a debt, nemesis, duty or other motivating factor that drives your character’s efforts on the fringes of galactic society.” (The mechanic returns as Duty in Age of Rebellion, and Motivation in Force and Destiny). A lot of RPGs use this story element to help propel the story forward, and a good GM will be able to weave these sorts of strands together as a part of his or her overall narrative to tell a truly immersive story. So, what about the dice? 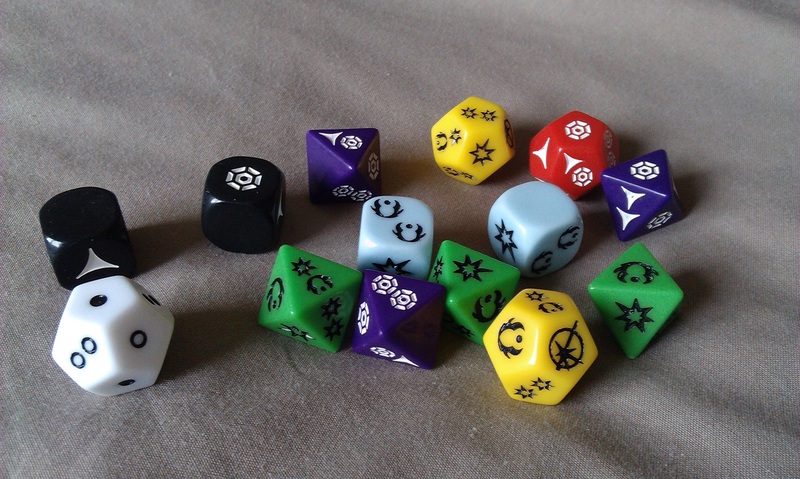 There are a number of different dice in the game, which all help to tell the narrative of the game you’re playing. Narrative dice? Yep, you heard that right. As a player, you have a pool of these dice that you roll when specified by a particular task. Dice can be added to or taken away from your pool by the GM to help reflect the narrative better. The blue and the black d6 are boost and setback dice, and are added to the pool to reflect the fact that your character might be particularly good at what he or she is doing, or might be trying to accomplish a task under fire. The green and the purple d8 are ability and difficulty dice, and reflect the core of how good or bad at accomplishing a task your character may be. Finally, the yellow and the red d12 are proficiency and challenge dice, and act as modifiers to the d8 versions, either reflective of just how good or how bad your character may be. The dice do take some getting used to, don’t get me wrong, but they’re certainly one of the most interesting aspects of this game system! While the Force can be used in Edge of the Empire, it didn’t really come to the fore until 2015’s Force and Destiny. Force powers work much like any other skill, of course, and you roll the white d12 to see how many Force points you roll to use on powers. Force and Destiny brought the Heal, Misdirect and the classic Battle Meditation powers to the fore, with each power following a tree akin to the career options, and as your character advances through the game, he or she can essentially level up within a chosen discipline. The RPG has had a fair number of expansions for each of the three strands at this point, with adventure modules and sourcebooks for many of the career options available to help immerse yourself in the Star Wars universe. 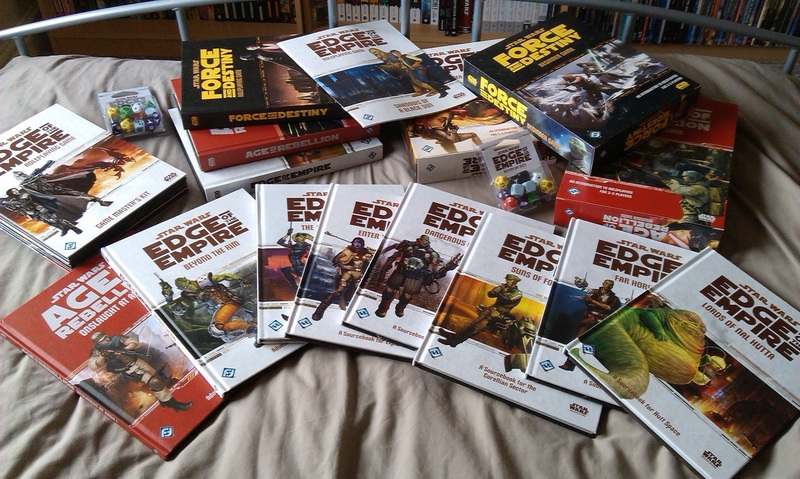 Naturally, Edge of the Empire has seen the majority of these, though the others are catching up. The interesting thing to note about the way these expansion books work is how specialized they are. While there have been a handful of sourcebooks on locations (such as the Corellian sector’s Suns of Fortune), and of course, adventure modules, the sourcebooks are predominantly focused around a career path, meaning that you won’t want to buy every single book if you’re playing a Colonist, for example. I find this interesting because it’s a much more consumer-friendly way of expanding the game than previous editions, which have usually incorporated rules that everybody would want to get their hands on within all manner of different books. Unfortunately, I haven’t had a RPG group for a while now, so I don’t know if this is still the case, but I’ve heard of groups where the GM buys everything and lets the group make use of it, as well as people picking and choosing what they get. If you’re heavily invested in just one player character type, then, you could feasibly get away with just buying one book, plus the core rules. FFG have also released The Force Awakens beginner game, which has so far not led into a fourth branch of the RPG, but rather felt more like a bit of a cash-grab. It’s a good way to introduce people to the game system who may have only jumped in once the film was released, of course, though the system is otherwise flexible enough that I would imagine you could set your games wherever you liked in the timeline. Notably, while some mention of now-Legends stuff has been made, there aren’t any “Knights of the Old Republic sourcebook” style products; instead, the system feels a little bland by giving you all the tools you need to create an adventure entirely of your own choice. 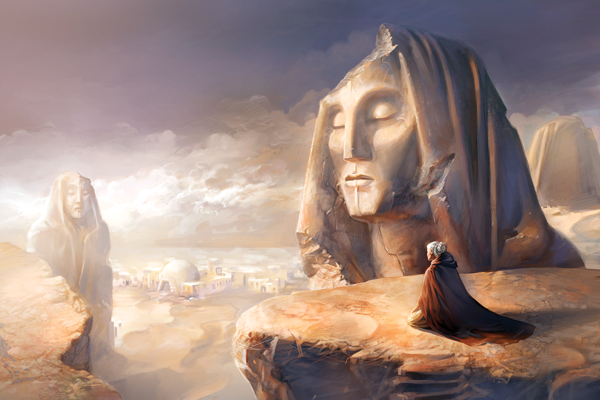 I say “a little bland”, because I think I’d prefer to tie my adventures more firmly into the narrative – certainly, that’s how I’ve run campaigns in the past – but by structuring the game in this way, FFG have actually left the universe pretty wide open. I mentioned in my Saga Edition blog that WotC ended their run on the RPG with a sourcebook that provided you with all of the tools you would need to forge a narrative entirely on your own; well, FFG started at that point, and have continued to provide books that are more along the lines of helpful nudges than hard-line stuff. It’s time to look at some new stuff! I’ve not really had much time lately to be checking out the new offerings in the board game world, having been trying to find a house. Having now bought a house, I’ve probably not got the money to go investigating some of these new offerings as much as I’d like, either! But I thought I’d just take a brief look at some of the things that are being advertised and see what’s going on. 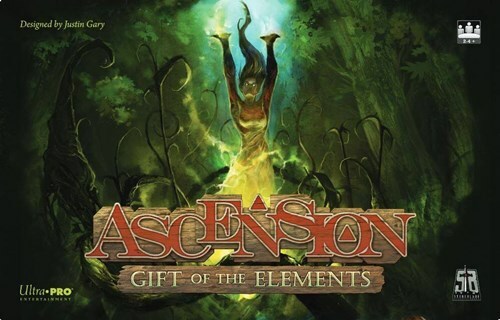 First up, there’s a new expansion for Ascension out, Gift of the Elements. Featuring all manner of weird and wonderful new (and returning) mechanics, it looks like this one changes up the game in a few interesting ways. Back when I wrote up my game day blog on this game, I mentioned that I played this one primarily on the app; currently a lot of the new expansions haven’t been made available for Android, but hopefully this will change soon enough! Blimey, Carcassonne is really branching out now! It’s been ages since I last had a game with the classic tile-laying game, and it seems like all manner of things have been happening since then! Under the Big Top seems like it could be one of those fun expansions that infuriates the hard-liners, those who used to denigrate things like the Catapult and Wheel of Fortune. Personally, I think people should be allowed to have their own fun, and nobody is going to force you to play with this, though I won’t be rushing to add it to my collection. 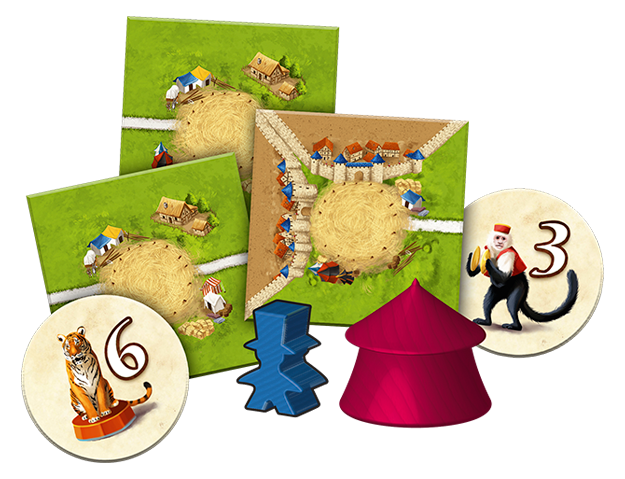 I think, for me, Carcassonne has become something of a nostalgia game, where I’m happy to remain at the point where I last enjoyed playing it, when Abbey & Mayor was a new thing. This new Genesys RPG system is being pushed kinda hard by Fantasy Flight, don’t you think? It certainly seems like an interesting idea, though I’m getting tired of seeing it popping up on social media as a sponsored ad every so often! Coming out towards the end of the year, the core rulebook features essentially a blank canvas for you to paint your games on. It’s built around the narrative dice system that is used by RPGs like Warhammer Fantasy and Star Wars, where you roll dice that don’t just tell you if you pass or fail a check, but rather how well you pass/badly you fail, and if there are complications. It’s a really great system, as it happens, so porting that over to a more de-restricted game like this is a great idea. The book comes with frameworks for five different setting types, from sci-fi to steampunk, so sounds like it could be a great way to start something new! The Call of Cthulhu RPG is something that I’ve quite liked the idea of getting into for a while now, but have never quite managed to pull the trigger. However, seeing this pop up as a new release has got me wanting to investigate more of what it has to offer! 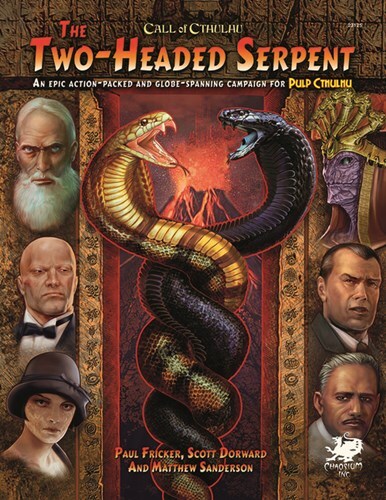 I enjoy a wide variety of Cthulhu games, primarily from Fantasy Flight, and this Two-Headed Serpent adventure sounds like a lot of fun akin to the globe-trotting Eldritch Horror! Though, I must admit, my first thoughts on seeing the artwork on the cover were of Fortune & Glory. I don’t have a playgroup that could support RPGs anymore, though, so it’s probably something that will languish. I’m a bit gutted that I missed Free RPG Day a couple of weeks ago, as I could perhaps have sampled the waters at my local store! Ah well! It’s another game day here at spalanz.com, and for today’s blog I’m doing something a little different, looking at a game that I’ve never actually played, and don’t think I ever will! 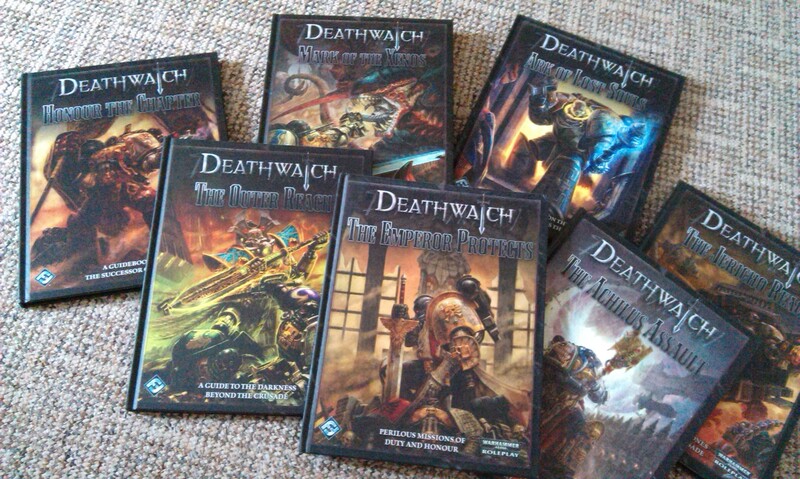 But expect a lot of waxing lyrical over the next few paragraphs, as I take a look at the Deathwatch RPG! One of Fantasy Flight’s four RPGs set in the Warhammer 40k universe, Deathwatch allows you to take on the role of a space marine as part of a Deathwatch kill team, in a variety of adventures, foremost of which are purging the xenos from the galaxy. The game is played in a d100 system, where you roll 2 d10s and add a modifier, hoping to roll under the target number. For example, your base stats are generated from rolling two d10s and adding 30. The check you attempt will then be against one of these stats, with a modifier to show how easy/hard it is (+30 for easy to -30 for very hard). So if you try to trick somebody who isn’t paying attention, you may have to roll against your fellowship characteristic with a modifier of +30, your target number could therefore be as high as 80. This core mechanic is somewhat confusing to someone like myself, who grew up on the d20 system, but it’s always good to try out new stuff! There are a few things that work alongside this, and one that is worth mentioning here is the Demeanour mechanic. It’s basically a nice way to get people to do some real roleplaying of their characters at the table – each character has two demeanours, a personal one and a Chapter-based one, but you can only use one of these once in any one game. While some people can be uncomfortable with this sort of thing, I suppose it’s important to point out here that it is a role-playing game, so you should expect to role-play at least a little… To me, at least, it sounds really cool! Each space marine character has a set of nine characteristics, which manage to evoke both the tabletop wargame as well as classic roleplaying archetypes: weapons skill, ballistics skill, strength, toughness, agility, intelligence, perception, willpower and fellowship. The interesting thing, for me, about the system is its use of solo mode and squad mode, as mentioned in the video trailer above. As a starting point, FFG published a web scenario, Final Sanction, which acts as an introduction to the game, and is highly recommended for getting into the game. It pits several pre-generated characters against a genestealer horde in a run-down manufactorum complex, that staple of Warhammer 40k lore! The game is set in the Jericho Reach, and a wealth of supplementary material has been published that explores that setting, including Necron Tomb Worlds and Tyranid invasions. The core book comes with rules for creating marines from one of six Chapters (Black Templars, Blood Angels, Dark Angels, Space Wolves, Storm Wardens and Ultramarines), though these supplements feature many, many more – my personal favourite was finding out that Novamarines are presented in Honour the Chapter! One of the draws of this game is always going to be the wide variety of space marine chapters you can choose to base your character upon. Having them all come together as a Deathwatch kill-team is going to cause some problems for unit cohesion, but this is where the solo mode shines, as you can retain that sense of your own chapter tactics, while in squad mode you can work together with your battle brothers to achieve the mission objective. It sounds really awesome, I have to say! I came to this game late in 2014, when I was first getting into the 40k universe with my Necrons, and was hungering for knowledge about the faction while waiting for the new Codex to drop. The Outer Reach really fired my imagination, not least because of that amazing cover art, and over the months since I’ve bought a few of the books available (as shown above!) While, as I said at the beginning of this blog, I don’t think I’ll ever get the chance to play this game, and it looks like FFG might actually have abandoned it now, it remains an idea that really interests me, and the books remain a constant delight to read through for background, etc. Author spalanzPosted on June 21, 2016 June 18, 2016 Categories board gamesTags Deathwatch, Fantasy Flight Games, Games Workshop, Role Playing Games, RPG, Warhammer 40kLeave a comment on Deathwatch! 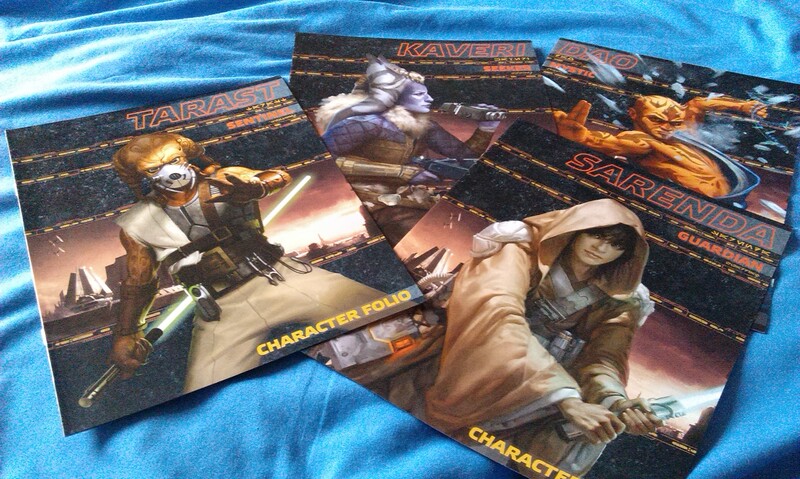 After all of the Star Wars excitement of the past weekend, it’s time for a very special game day today – it’s a blog that I’ve been ruminating over for close to two years, in fact! 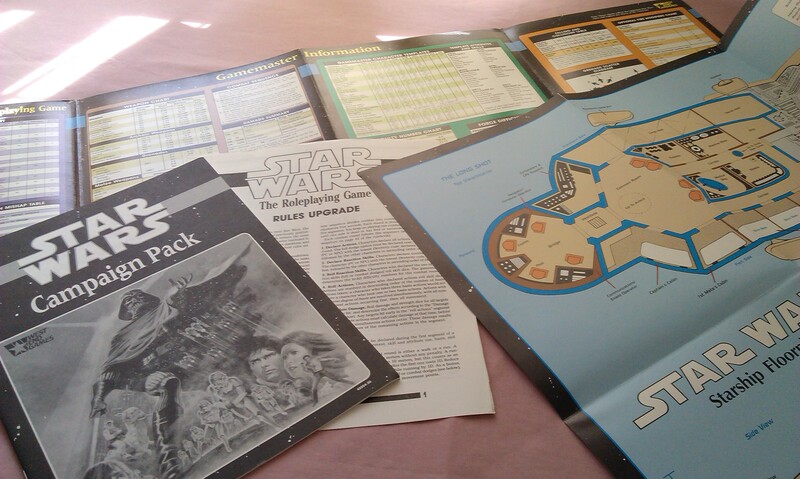 Let me take you back in time, to the late 1980s, and the original Star Wars Roleplaying Game from West End Games! This bad boy dates back to 1987, and it still gives me chills to pick up any of the books produced to support the run. I may as well tell you now, this blog will be quite heavily biased in the game’s favour! The game system is based on West End Games’ d6 Roleplaying System, originally developed for a Ghostbusters RPG. The system is fairly straightforward to use – the core rulebook features a number of templates for characters to use from the off, or you could also create your own character from scratch. Your character has six attributes – dexterity, knowledge, mechanical, perception, strength and technical – along with a number of skills that are grouped under each attribute. These attributes all have a code against them that shows the number of six-sided dice (d6) you roll when making a test involving that attribute, often along with a modifier that would be applied to the final result. When rolling for tests, you need to equal or exceed the opposed result in order to succeed at that test. My own character sheet from my one and only foray into the WEG system! That’s pretty much all there is to it. There are some rules for the Force, though as this was in a time where the original trilogy was the only thing around for fans of the franchise, there wasn’t a lot to go on and so the rulebook doesn’t spend a lot of time on it. Interestingly, though, the rules state that you can learn a Force skill from a character who is willing to teach you – implying that anyone can use the mystical energy field! Something important about this system, however, is its categorization of Jedi powers into three groups: control, sense and alter. These are so often used nowadays in Star Wars gaming, it’s interesting to note that this is where that categorization started! Of course, the main focus of roleplaying games in the Star Wars universe is combat, which is divided into action segments. During each segment, a player can use one skill or attribute, or move – the latter usually having an adverse affect on the dice rolling. Initiative is handled weirdly – weirdly, in comparison to other systems – in that players roll together when they’re doing something that will affect each other, and whoever has the higher result is deemed to have initiative and thus gets to have their action happen. I can’t think of another system that I’ve played that doesn’t have Initiative on the stat line, anyway! The rulebook features a fairly comprehensive GM section, including advice on everything you could need to run an adventure. It also has a short adventure included, “Rebel Breakout”, which gets you into the feel for how WEG adventures work, broken into a series of encounters within larger episodes. These are often broken up with useful sidebars with information you might want to use, and also blocks of text you can read aloud as GM to set the feel. Along with an extensive bank of character templates is a series of adventure ideas you can use to populate your own games! As I said before, the West End Games line features a whole raft of supporting material, from sourcebooks to adventure modules that you can use as preconstructed adventures, either to play as a stand-alone experience, or to slip into an ongoing adventure. In the early days, they also produced the above Campaign Pack, which came in a number of components – a GM screen, an adventure book, rules upgrades, and a fold-out map of a starship. The adventure book features advice for running a campaign as well as a short adventure, similar to the book included with the Gamemaster Kit, which features the Bissillirus Campaign. I wanted to mention this specifically because of the enormous production value of the product – the book fully fleshes-out the Trax Sector in a manner that would become commonplace for further WEG content, as well as providing some advice on building Rebel cells presented as in-universe advice from General Airen Cracken. This brings me on to an extremely huge point about West End Games’ books – they effectively created the expanded universe with this enormous wealth of content, from creating new worlds to filling-out background on existing worlds. They also started the trend of providing names and backstories for all of the extras and bit-players in the movies – who’d have thought this guy, who was little more than set-dressing for Return of the Jedi, would become so important to the EU, as none other than the head of Alliance Intelligence, Airen Cracken himself! 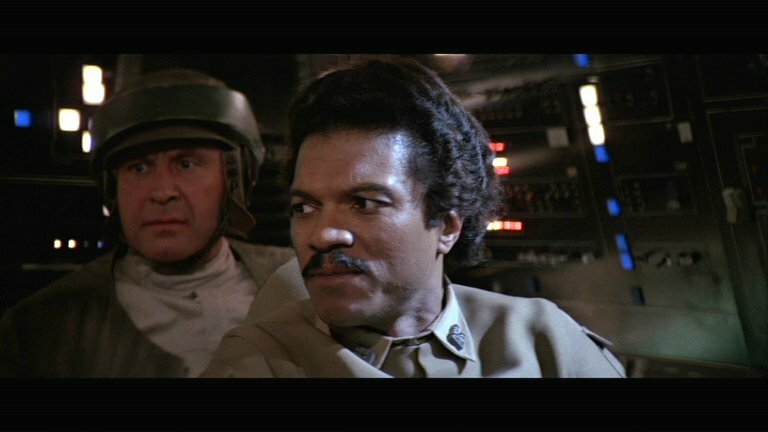 No, not Lando – the guy in the background! Oh yes, their service to Star Wars lore simply cannot be understated! In addition to providing the backstory, however, they also created the lore through the Star Wars Adventure Journal – a quarterly “magazine” that featured all sorts of stuff, from campaign settings to short fiction. I’ve mentioned this before, of course, back when I read some of that fiction (such as Command Decision), and while the Journal only ran to fifteen issues, it nevertheless has a whole host of amazing stuff to enjoy. Returning to the subject of fleshing out existing stuff, I want to talk a bit about perhaps one of the more famous adventure modules WEG produced: Tatooine Manhunt! This was published in 1988, and I believe was the first full-length adventure module they produced. 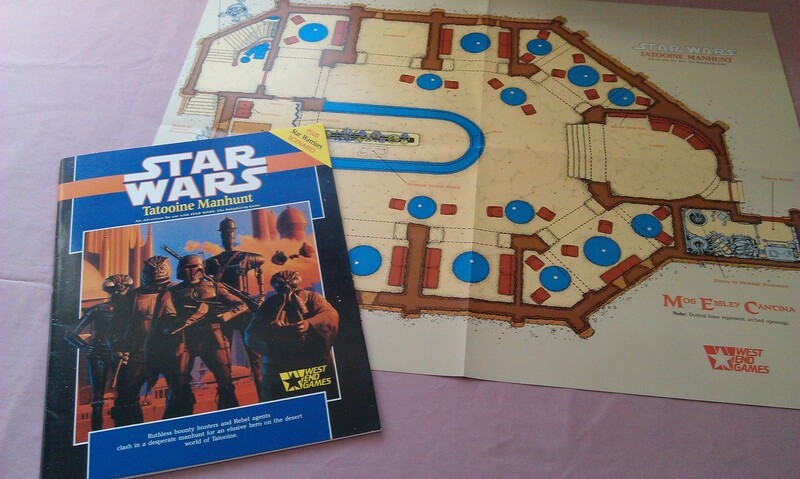 The Ralph McQuarrie cover art is another hallmark of the line, along with the fold-out map (double-sided – the reverse has the city of Mos Eisley itself, with local landmarks labelled). The adventure follows a band of rebels (the players) aboard Kwenn Space Station who, learning that the Clone Wars veteran Adar Tallon has been discovered to be alive and well and living on Tatooine, and that the Galactic Empire has put a bounty on his head, travel to the desert world in an attempt to rescue him from the Emperor’s clutches. The book introduces us to several bounty hunters – the cover art is misleading as, while it represents the blueprint for Vader’s bounty hunters in Empire Strikes Back, the hunters featured in the module are entirely new characters. Notably, we have the first appearance of Jodo Kast, a Boba Fett impersonator who would go on to have a fairly detailed history in Star Wars. WEG used him in several other books as a Boba Fett stand-in, and he has crossed over into both novels (the short story Side Trip, by Timothy Zahn and Michael A Stackpole, features Grand Admiral Thrawn using the personal of Kast) and comics (Twin Engines of Destruction saw the then-canon death of Kast, at the hands of none other than Boba Fett himself). Adar Tallon would also go on to a fairly interesting career in the lore, and also made it into comics for the Republic series, Dreadnoughts of Rendili. I barely got to play with this system while in college – West End Games lost the licence to Wizards of the Coast in 1998, who produced three editions of the RPG, latterly Saga Edition, which I’ve already covered. But d6 West End Games will always hold that special place in my heart, both for the enormous impact it had on the Star Wars universe, and also for having gotten me interested not only just in Star Wars gaming, but in creating my own stories within the galaxy far, far away. 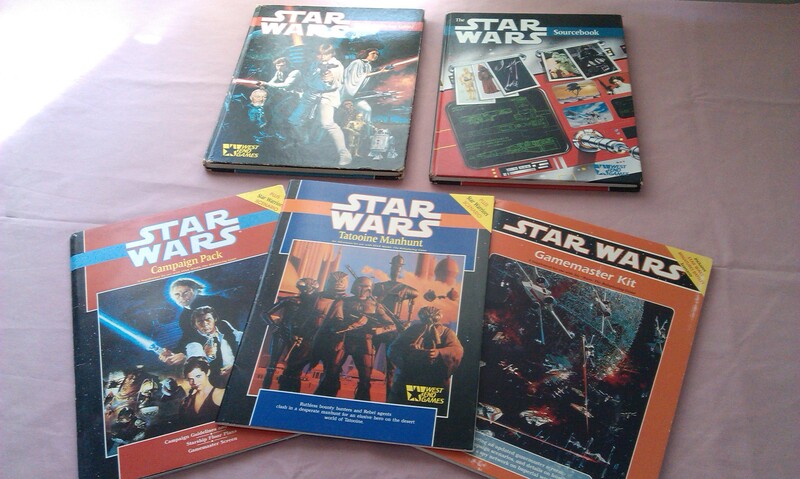 I’m only scratching the surface of the amazing source of Star Wars lore that the West End Games stuff supplies, and will likely be showcasing more of these books as time goes on. It’s become something of a Christmas tradition for me to reacquaint myself with one module (last year, it was none other than Tatooine Manhunt!) so I’m sure I’ll be sharing the wealth in the future! 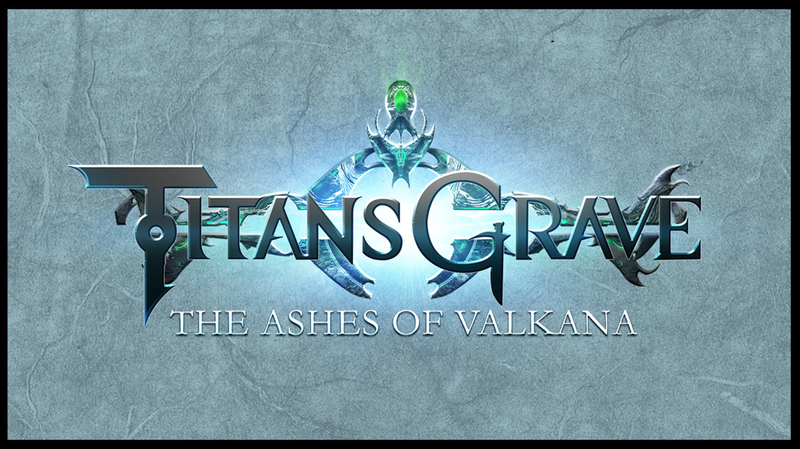 It’s time for another game day blog here at spalanz.com, and today I’m doing something a little different, as I ramble about the amazing series from Geek & Sundry, Titansgrave: The Ashes of Valkana! So I know I’m a bit late with this, the series having ended back in August, but I’ve inexplicably only now been able to actually catch up with this! Well, finished watching it last week, but anyway. I love a good roleplaying game, so when it was announced during the funding for season 3 of Tabletop they were going to produce a RPG show, I was really intrigued. I mean, most of the joy of playing in a RPG campaign comes from the imagination as you weave this tale with the group. So how would that translate to the show? Well, “fabulously” is the answer there! If you have watched only one of the ten episodes from this series, you’ll see the amazing way in which footage of the group is interspersed with full-on art depicting the action, combined with the special effects that make this almost like a real tv show. But what about the game? The RPG itself is the relatively straightforward d6 Fantasy AGE system from Green Ronin Games. I’ve talked about RPGs briefly here, so moving on from that, the system uses three six-sided dice, one of which is a different colour, when completing any skill tests. If doubles are rolled, the differently-coloured die is used to give the player stunt points, which can be used to make the test more interesting that merely pass or fail. It’s quite a straightforward system that seems to allow more focus for storytelling than for working out dice results, as is sometimes the case other systems. This really shows in the show, where the characters roll the dice, a pass or fail is determined, stunt points are applied if rolled, then the story advances with what that roll actually meant. For me, this is where the show really shines as a truly beautiful creation. Watching Wil take the group through the story he has come up with, from the relatively inane saving of the beer quest, to the fight with the hellions and all the way up to the battle with the Prophet, it reminds me of just how amazing a role playing game can be – not just as a game, but as a whole experience. The structure is classic, throwing more and more at the characters as they level up, and allowing plenty of player-creativity as the story moves along. Indeed, I was quite surprised by the ninth episode, which almost does away completely with the latter, and takes on the mantle of a choose your own adventure, almost. While I’ve played that sort of RPG before, it’s usually done because the players aren’t coming up with enough story by themselves, and yet we’ve obviously seen the group is more than capable of doing this. The setting is also worth mentioning as being astonishingly interesting. Wil says it was inspired by Thundarr the Barbarian, though that was a little too old for me – I grew up with He-Man, which is another of these science-fantasy type shows, so I still feel a little bit of nostalgia creeping in by watching this. Inspiration aside, it’s awesome to see the sense of history and the dramatic depth come out as the show moves ahead. While in retrospect I felt that the confrontation leading up to the finale could perhaps have benefited from a greater sense of mystery, with the players uncovering information as they moved through the story, it nevertheless felt like a really immersive experience just as a spectator! I don’t get to play RPGs any more, so I haven’t bought the book for this game. However, it looks like it’s certainly worth checking out, and I cannot wait to see what’s in store for season two! Welcome to game day 2016! For the inaugural games blog of the year, I’m starting with a look back over 2015 for my favourite games company, Fantasy Flight Games, and all of the awesomeness they brought us – including my top, er, six games from the year! These were incredibly difficult to rank, so I’ve basically not even tried – instead, they’re presented roughly chronologically, along with a look at the new editions and other great stuff out of Roseville. Enjoy! The second expansion for Elder Sign, Gates of Arkham totally changed how the game plays, with double-sided location cards and the new gates mechanic. With the recent announcement of Omens of Ice, it seems to have set the tone for the future of the game, also. While it’s true that this expansion is vastly different from the base game, and lovers of the game may be turned off by such a drastic change to the system, it’s nevertheless a wonderful Arkham-lite experience, and definitely needs to be tried! 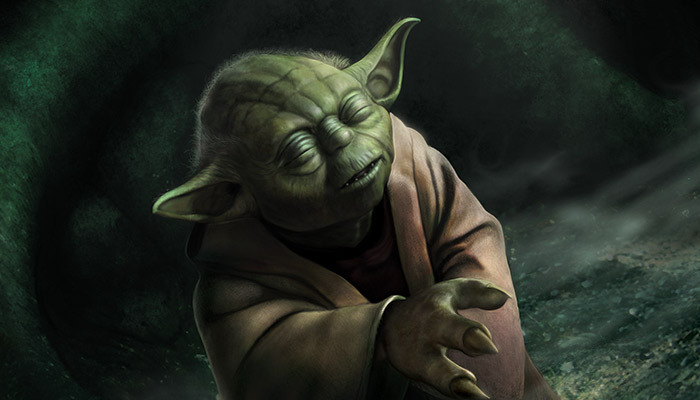 When FFG’s Star Wars roleplaying system was announced back in 2012, we all knew Jedi and other Force-users would be the third tranche of the game. Well, that has finally come to pass with Force and Destiny, which debuted in the summer. 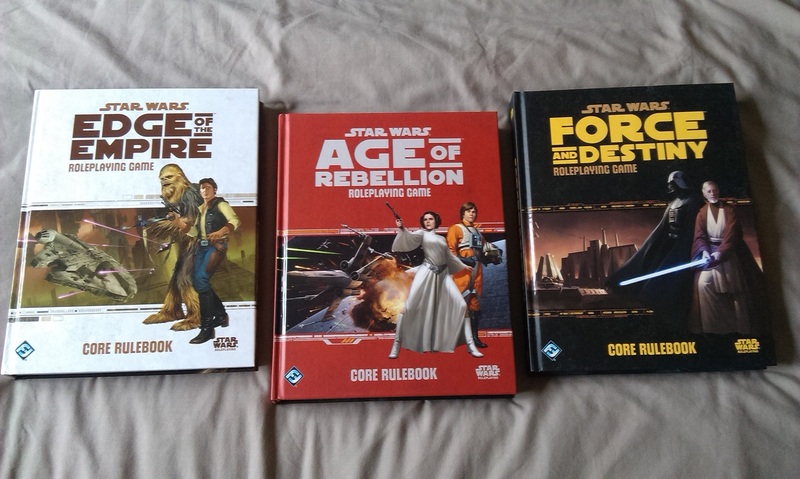 Starting with the beginner game, we’ve also had the core book and two supplemental books before the year’s end, providing yet more adventure for Jedi players out there! While I haven’t yet gotten to try this game, it is a beautiful product, and everything I’ve heard about it has been extremely positive. Hopefully next year I’ll get to try this out at last! A really interesting game, a bit like Warhammer 40k in space rather than the usual ground-based battles. Forbidden Stars is a game I’ve only tried once, and is the usual FFG affair of lavish boardgaming that I can never say no to. It’s certainly one I’d like to get round to playing more often, as I feel there are layers upon layers of strategy here that need to be explored! Another Games Workshop tie-in, Warhammer Quest is an interesting amalgamation of card game types, perhaps most strongly of Lord of the Rings LCG. The game certainly has everything fans of the Old World will enjoy, with FFG’s trademark high quality production, and proves to be a really immersive experience. Replayability is perhaps a concern during this early release period, however the success it appears to have been so far should warrant expansions soon enough, so I’ve high hopes we will be enjoying some dungeon-delving fun for a long time to come! Ending the year with another Lovecraftian game, the second big-box expansion for Eldritch Horror takes us to Egypt with a new sideboard, new investigators and ancient ones, and new adventures! I really enjoyed this expansion, perhaps not as much as Mountains of Madness, but all the same, it gives us fans of Eldritch Horror a lot to enjoy – so much so that a few games will only scratch the surface. I really like the tradition of having a new big box for Christmas, so hope we’ll see this continue for the next few years, at least. 2015 seemed to have a lot of these. Drakon, Cave Troll, Tigris and Euphrates… Biggest on my list, however, were Fury of Dracula and Runebound. I’d only actually played the earlier edition of Fury of Dracula once, and it wasn’t the best outing due to being merely a two player experience. However, the game seemed interesting enough, so it’s been on my radar somewhat following the re-release. It’s definitely one that I feel would do best in the multiplayer environment, however. Runebound will forever be one of my all-time favourites in its second-edition incarnation, but the new third edition looked far too interesting to pass up when it came out. Again, one that I haven’t had a chance to try yet, expect an exhaustive review once I have brought it to the table. Let’s see how well Terrinoth is re-implemented! A Game of Thrones LCG also got itself a new edition, barely with the first edition ending back in May. I love the first edition, and consider it to be one of my all-time favourites, even if I do struggle to get any games in anymore, so I haven’t jumped on this particular one, however it is good to see some continued games in Westeros. After what felt like an age, the Imperial Raider was released for X-Wing. First promised around February, and eventually arriving in August, I’d actually dipped out from the game by the time is came along, so have yet to pick up a copy. It’ll no doubt happen eventually, of course! We also got a second huge ship for the Empire, the Imperial Assault Carrier, which looked too hilarious for me to pass up on. Coming with a slew of new TIE-fighter pilots, however, it’s actually worth getting if you have no interest in epic play. Speaking of X-Wing, a new core set was released to tie-in with the new movie, with a new damage deck and some slight amendments to the order of actions etc. Perhaps crucially, though, it also helped to steer the game closer to the new canon, rather than continuing to explore the now-legends expanded universe. Expect more as the new books and movies roll out! 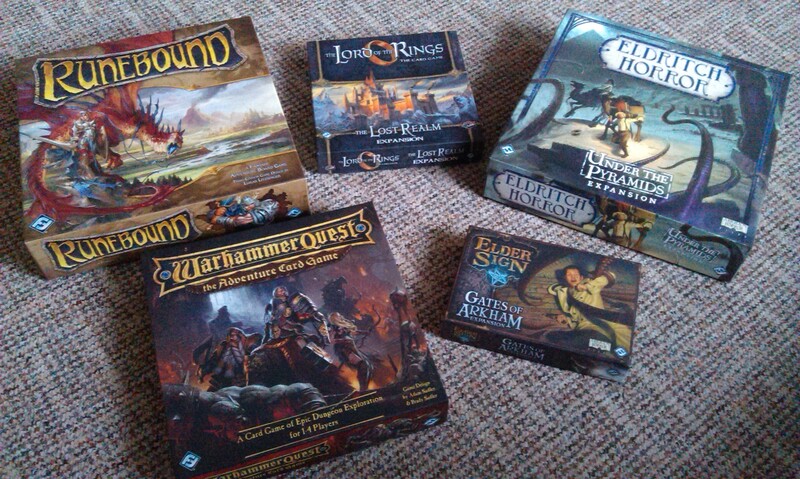 With the end to Call of Cthulhu LCG, Fantasy Flight are now down to five living card games. However, they’ll be back up to six next August with the release of Legend of the Five Rings, the long-running CCG, re-envisioned as a LCG. While I’ve seen some criticism, it could be a fine step for the game, so we’ll have to see how this one plays out. On the subject of LCGs, we also had the fourth deluxe expansion for Android Netrunner, Data and Destiny. I feel this one is worth a mention because of the neutral runners it has introduced to the game, something that is a particularly interesting development. I’ve not had much chance to try any of them out yet, though have been tinkering at one deck, so hopefully I can get to try that soon enough! So there you have it, my retrospective of Fantasy Flight’s 2015 releases. What did you think of the year? Have I missed out anything you thought was amazing? Let me know in the comments! It’s June 20th, so that means: Free RPG Day! It’s the eighth such day this year, where publishers print small modules or adventures designed to grow the number of folks playing RPGs, which I think is just superb! I’m celebrating by taking a look at the brand-new Force and Destiny beginner game from Fantasy Flight Games! 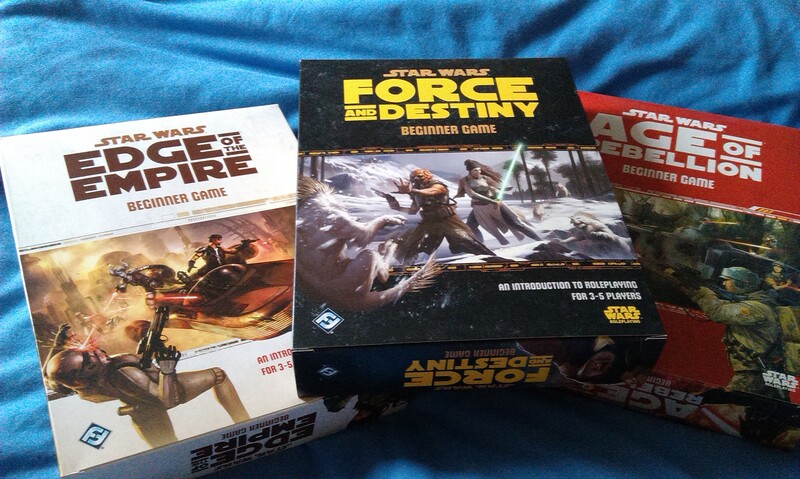 The third and final iteration of their Star Wars RPG line, Force and Destiny brings Force-users into the game properly (previous rulebooks included basic information on Force-users, but this is where you really get the meat for such characters). As with all Fantasy Flight products, this game looks beautiful. I believe the beginner games are pretty basic, designed more to give players the introduction to the game than to really set the world on fire, and most people seem to get them for the maps and, at one time, as an easier way to get more dice. FFG’s Star Wars RPG uses custom dice designed to make things easier to tell the story, rather than simply focusing on numerical targets as with the Saga Edition RPG, for instance. So you roll to see if you succeed at a test, and the dice will not only tell you that, but also just how well you succeeded or failed. Or you might succeed, but something else goes wrong. It sounds like a really excellent way to tell the story, and I’m hoping that it won’t be too long before I can get to try this out for myself! The adventure features seven encounters designed to tell the story of a rescue mission undertaken by the four heroes who have folios in the box. The first four are fairly straightforward things, designed to get new players (including new GMs) comfortable with the RPG experience. There is an interlude, which demonstrates levelling-up a character, and while it’s not online yet, there is also mention of a follow-up mission called Lure of the Lost, as well as two more character folios for download. This follows the previous Beginner Games with having more content while we wait for the main core rules to arrive. The rulebook here is a mere 48 pages long, so around 400 pages shorter than the main core rules will be! It features just enough information that should allow players to have further adventures with the system beyond that included in the adventure book, so we have rules for talents and equipment, as well as NPC adversaries the GM can throw at the players. The map is double-sided, so you can play with different locations if you so wish, as well. All in all, it’s a great little product that should get people up and running in the game system, even providing stuff to allow you to go beyond with more adventures. Obviously it’s no substitute for the core rulebook, but it’ll do the job for new players while providing veterans with enough to keep them going. Highly recommended! If you’re wondering just what the hell all this RPG stuff is all about, and struggling to see how rolling some dice can be any fun whatsoever without any kind of board or card additions, then I suppose this is the ideal opportunity to show you this. Following on from the success of Tabletop, Wil Wheaton has now got the fabled RPG show up and running, Titansgrave! I finally got round to watching the first two chapters last night, and it was insanely good – take a look here if you don’t believe me! Titansgrave sounds like a truly great series, it definitely has the right sort of folks to make it a classic for me, at any rate. Certainly looking forward to seeing how the series shapes up from here on, anyway! Author spalanzPosted on June 20, 2015 June 20, 2015 Categories board gamesTags Force and Destiny, Free RPG Day, Role Playing Games, RPG, Star Wars, TitansgraveLeave a comment on Happy Free RPG Day!